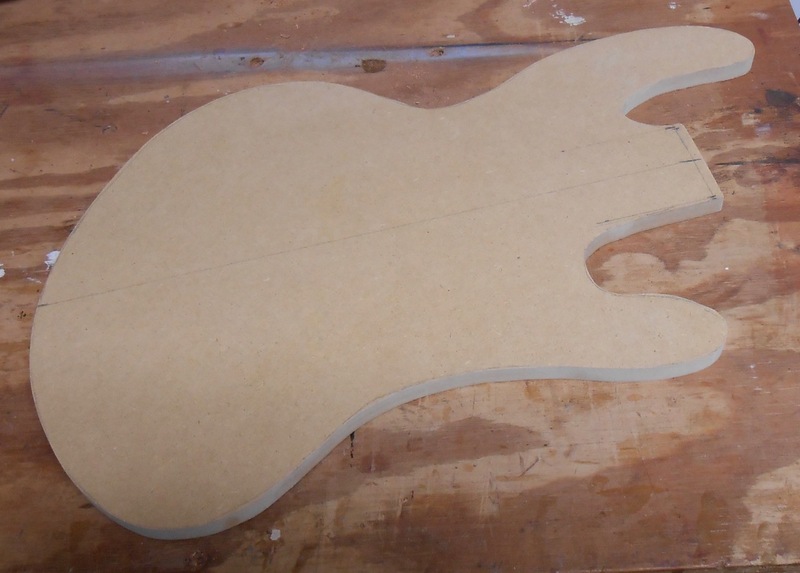 Well, even with wedges to hold the saw kerf open, this is taking forever. . .
. . . so I cut out a body template from some MDF I had. I still need to clean it up around the neck area, but I want to make the neck first so I know what size pocket to cut. But hey, progress! I know there must be better ways to do this, but they all seem to involve large bandsaws, which I don’t have. 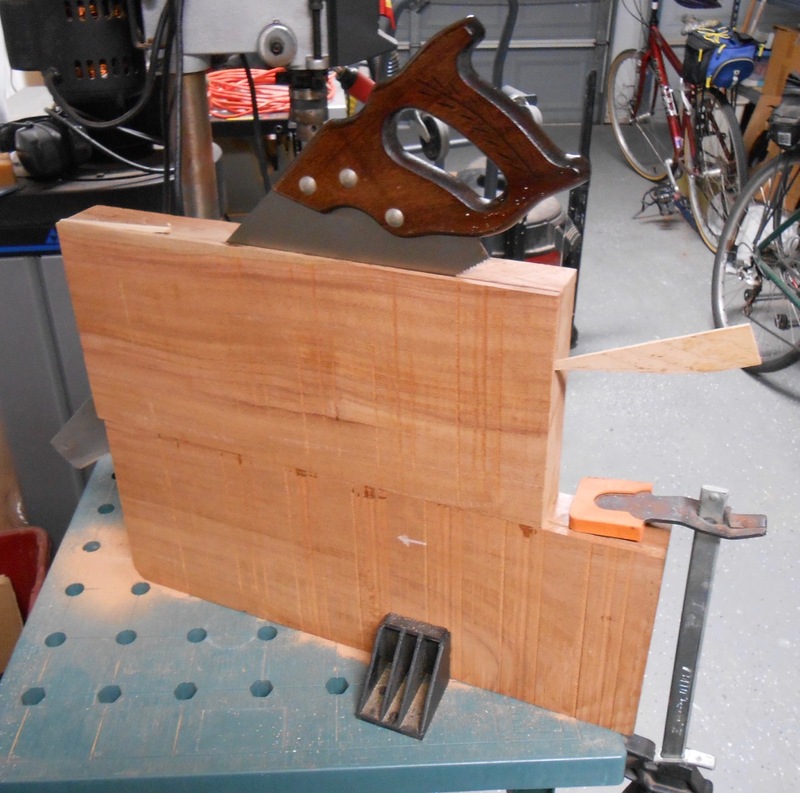 First you cut around the edges with the table saw (which really needs a tall fence to do it right) then use the resulting kerf as a guide for the handsaw. Simple, right? I figure if I take a few strokes every time I walk by, I’ll be done in a month or so. 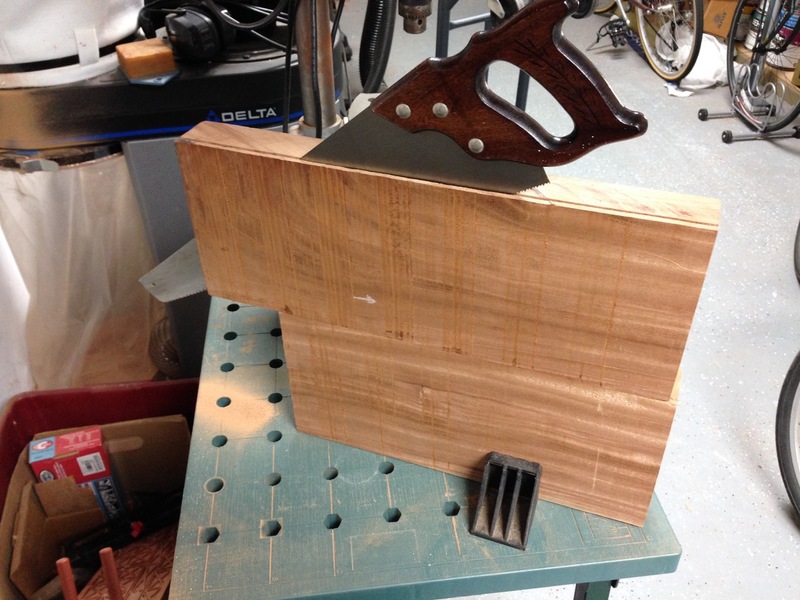 In the future, I’ll try to remember to do this before gluing the halves together. Not really a very good photo. Sealer is still wet and has runs in it, but that’s okay for now. I did some work on uke necks also, but didn’t photograph them. Not sure if it’s cherry or strawberry, but I’m not going to lick it. 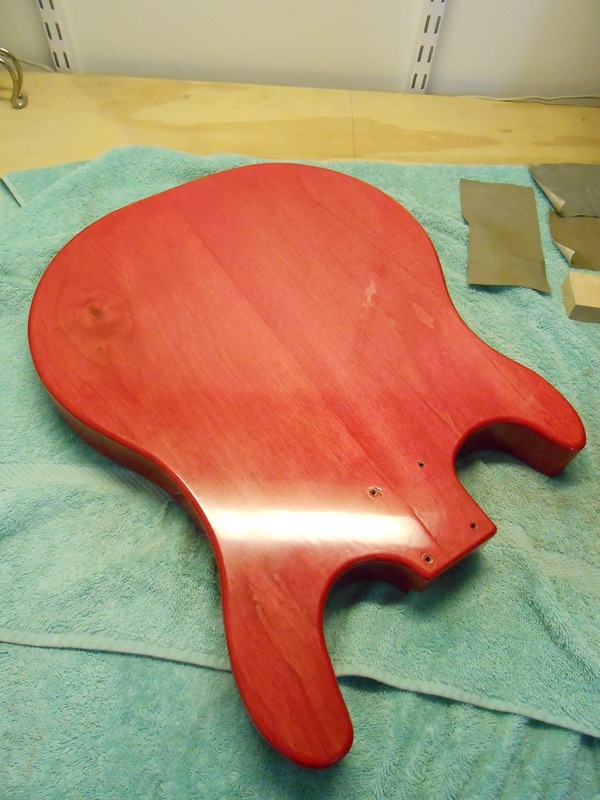 Since last week, I’ve moved the neck pocket back a quarter-inch and deepened it just enough to get a smooth floor. The largest control cavity was deepened and smoothed similarly, and the edges more-or-less cleaned up. 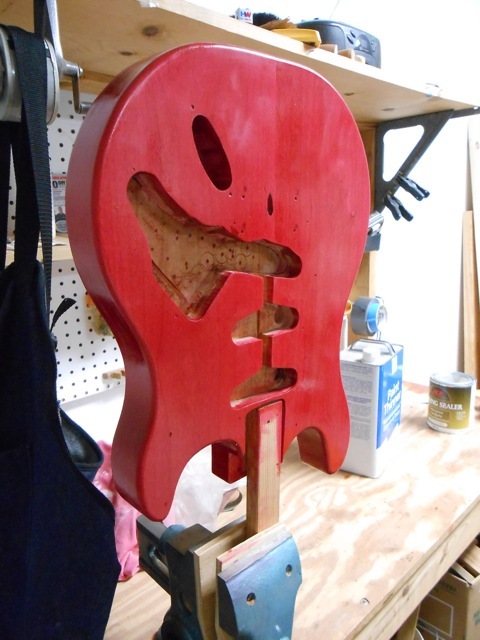 The jack cavity was smoothed out. 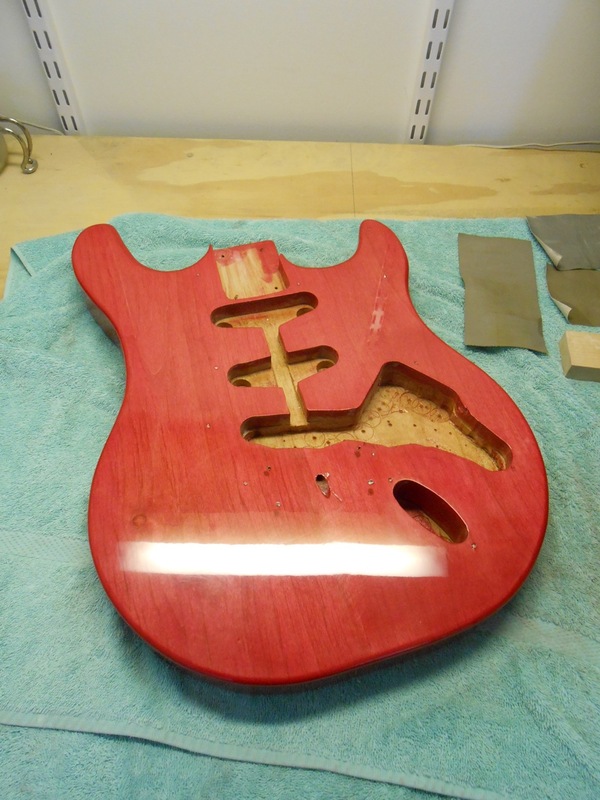 Bridge was repositioned for proper intonation, existing holes filled, and new holes drilled. Oh yeah, I dyed it red. 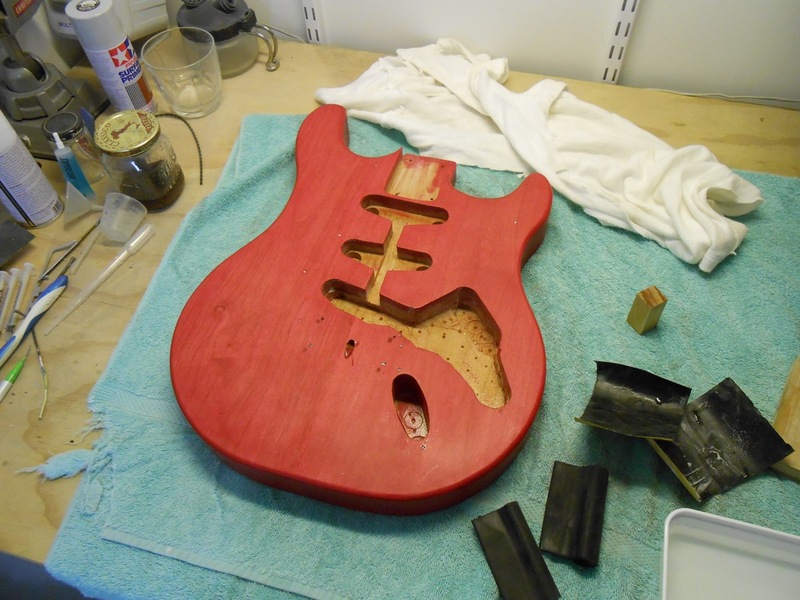 This is just the first coat, which will be sanded back, then a second coat added. That’s an alder blank with a routing template on top of it. 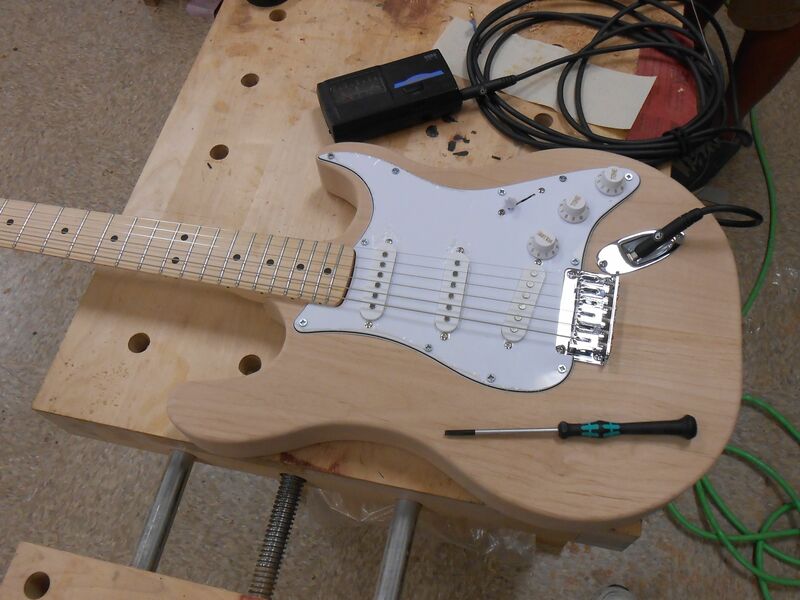 Here it is basically complete and in the white, trying to set the intonation. 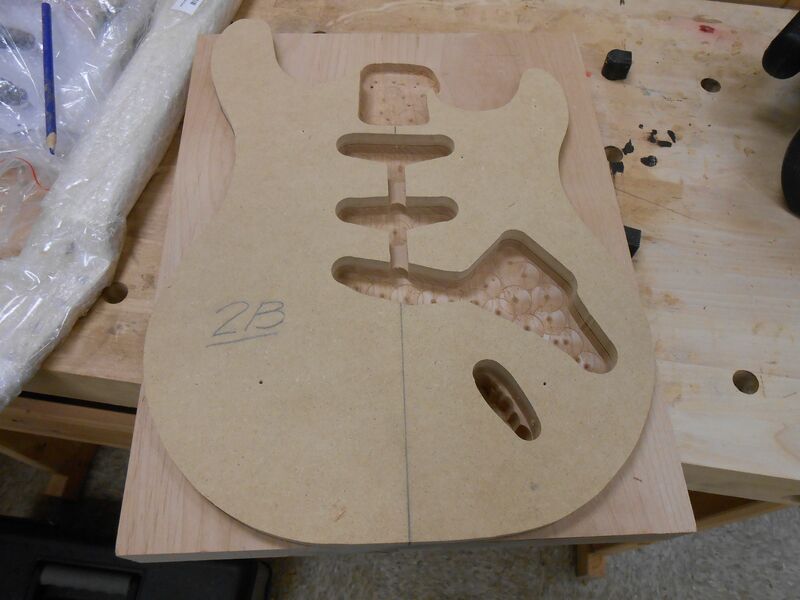 This is right before I discovered that I’d placed the bridge for a 25.5″ scale length and had installed a 24″ neck. No problem, I’ll just channel my inner Fix-It Felix and get it straightened out. Have to enlarge and clean up some of those electronics cavities anyway. 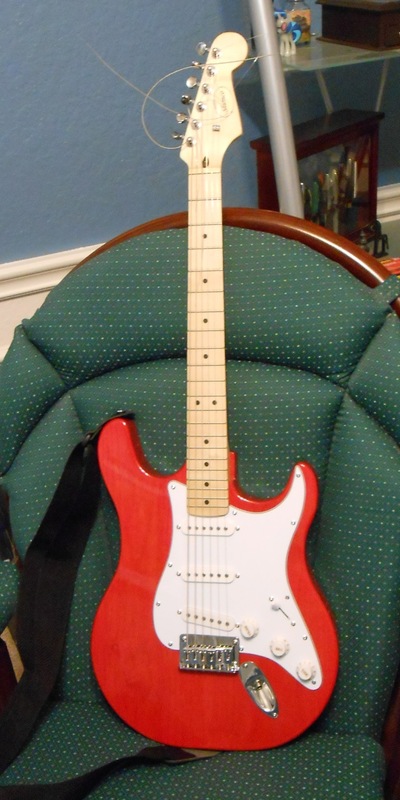 It does actually make guitar-type sounds, although it will need major setup work before it’s really playable. By someone else, not me, because it has too many strings. The class was taught by Frank Coleman, and all four of us students had a functional instrument at the end. I’d call it a success. 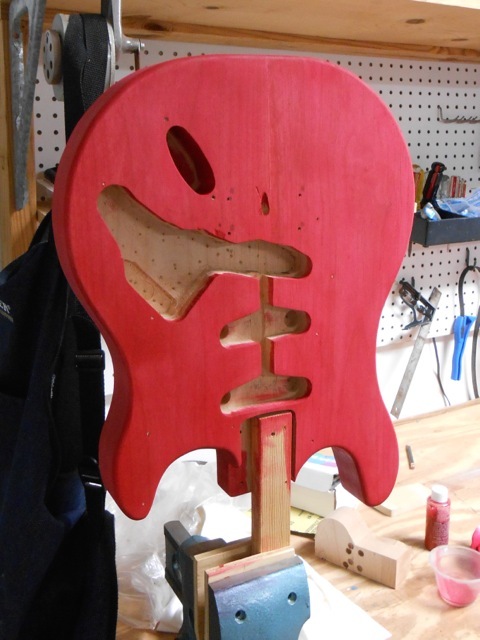 Stay tuned for more progress as I get it closer to a tuned-up and finished instrument. Don’t hold your breath, though; this could take a while.